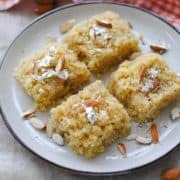 Badam Burfi is one of those delightful Indian desserts that you just won’t be able to resist. A holiday special, this fudge-like sweet is made with whole milk powder, almonds, ghee, sugar and cardamom. Yum! Cut the 5 almonds into slivers. Keep aside. Put the remaining 15 almonds and the cardamom seeds in a small grinder and grind to a powder. In a deep bowl, put the milk powder, the above almond + cardamom powder, ghee and sugar. Add 1/3 cup water and whisk to make a thick paste. Spread the mixture on a tray and cut into squares or diamonds. Garnish with the slivered almonds and silver leaf, if using. Serve warm. Deseeded green cardamom is available in any Indian store, but I often don’t go to the trouble of buying it. It’s not at all difficult to peel some whole green cardamom and take out the seeds. Ghee is also very easily available in Indian stores. Avoid substituting with oil, however, if you can help it. The burfi will not taste the same with oil. Grind the almond and cardamom seeds to a powder, but don’t over-grind because the almonds will start congealing. Even if they are a little coarsely ground, it doesn’t matter. The almond bits will actually taste good in the burfi! Use a deep, microwave safe dish and keep an eye on the mixture while it is cooking in the microwave, so it doesn’t boil over. It will rise and coat the sides of the dish, but if the dish is deep enough it won’t spill, especially as it thickens.